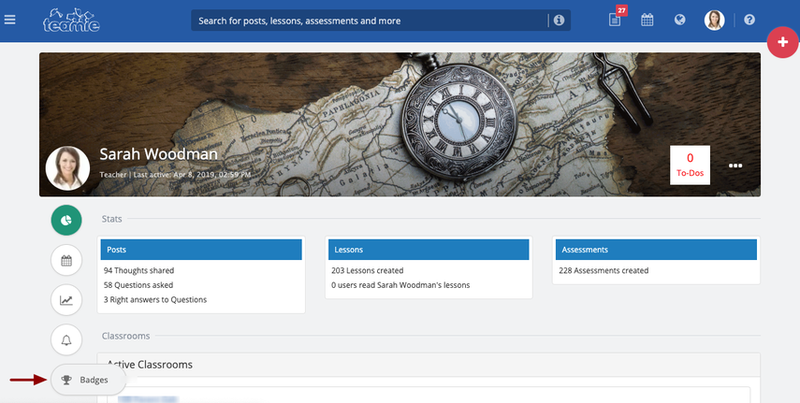 Gamification provides a unique way to engage users on a platform by adding elements that encourage engagement by rewarding user participation. Badges help achieve an even higher level of engagement & stimulate collaboration within teams and also motivate individuals to achieve more on the platform. 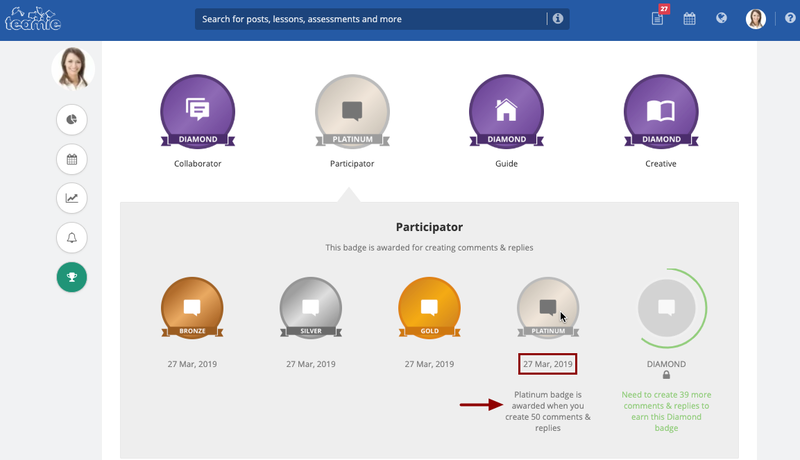 Badges are awarded to both "Learners and Instructors" for their activities on the platform over time. Lets see how it works for the instructor role. Bronze being the lowest level of achievement for a badge and Diamond being the highest. Instructors need to achieve a predefined count of an activity in order to move to a higher badge level. To earn a bronze badge, 10 counts of an activity needs to be done. For example, instructors will be awarded a Bronze Collaborator badge when they have posted at least 10 thoughts / questions. Similarly, for posting 20, 30, 50, 100 posts, instructors will be awarded badges of Silver,Gold,Platinum and Diamond respectively. 3. A label will be shown on the badge to show the highest level of achievement gained by you for the badge. 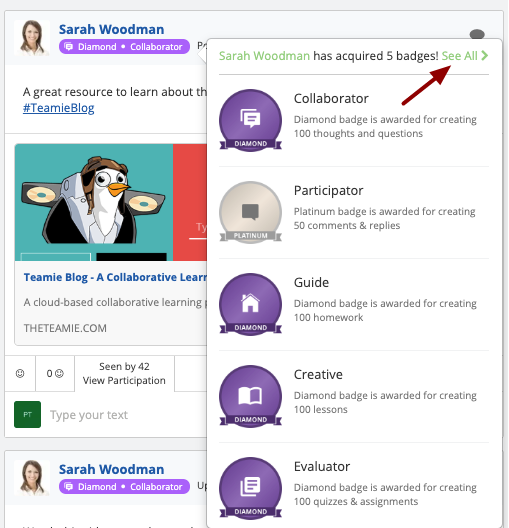 For example, in the following screenshot, the instructor has achieved DIAMOND level of achievement for Collaborator badge. 4. Clicking on a badge will open a detailed view. This view shows the badges earned by an instructor along with the dates on which they were awarded. 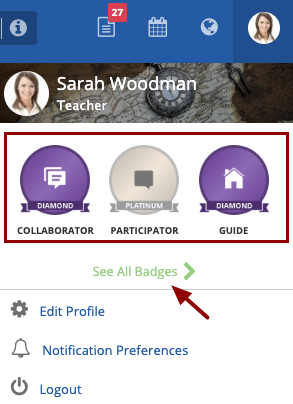 Hovering over a badge will show the activity count required to earn the badge. The highest badge that instructors are awarded, most recently, will also be reflected on their newsfeed posts. 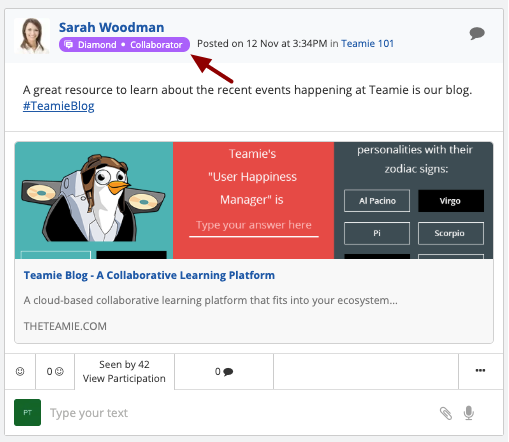 This way, you can see each others badges and get motivated to engage more on the platform. The way this will work is that the highest badge an instructors have been awarded most recently, will be shown as a tag in front of his/her name on the posts created by them. 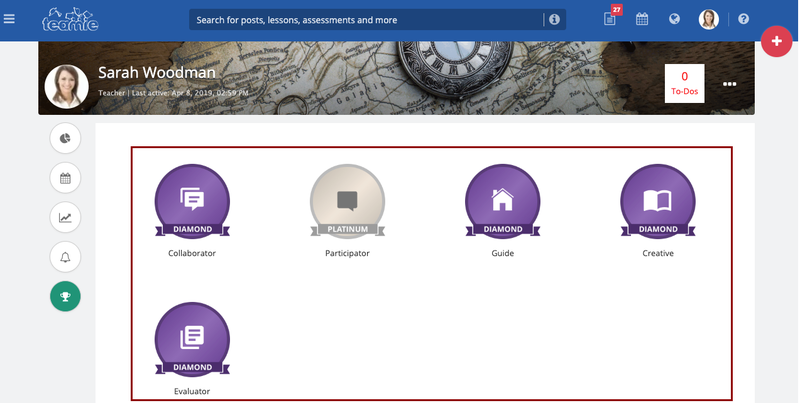 You can also view this badge details for learners as well on the posts shared by them. 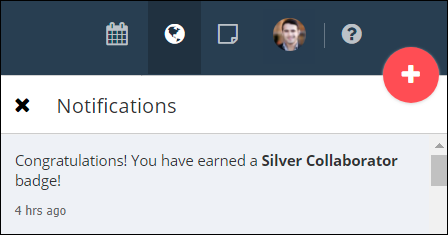 Let's see how you can view badges on the newsfeed posts. 1. Scroll to the post shared by the user whose badge details you wish to see. The highest badge an instructor has been awarded most recently, will be shown as a tag in front of his/her name on the posts created by them. 2. 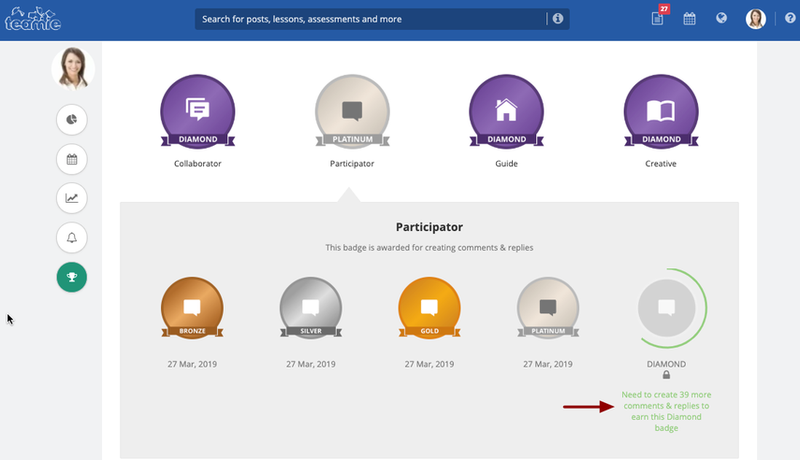 Click on the tag to open the list of the five highest badges that the instructor has been awarded. 3. 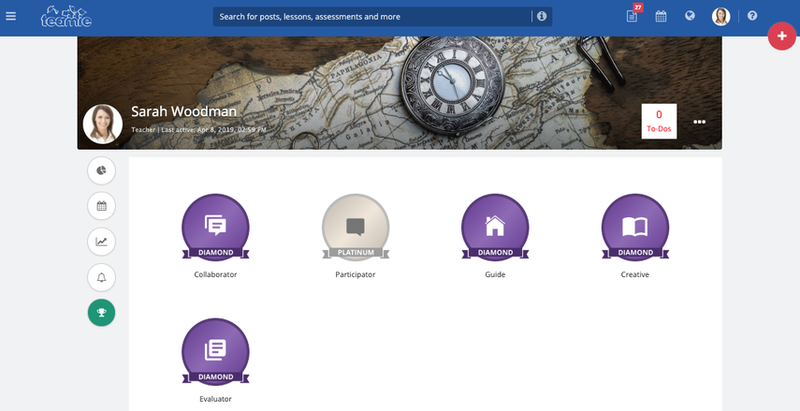 Click See All to navigate to the Badges tab to view all the badges that the instructor has been awarded.